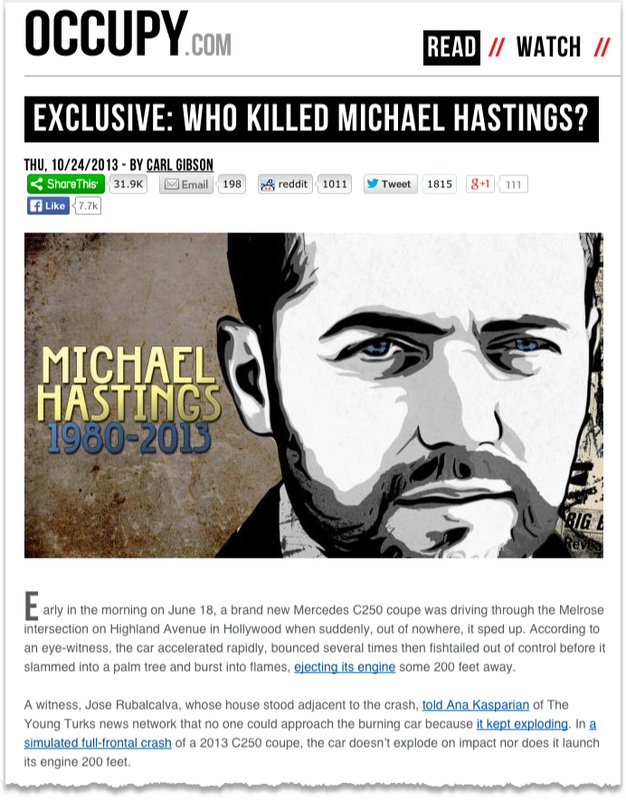 Was journalist Michael Hasting's car hacked? Intel Research Scientists Hack Slot Cars to Illustrate Vulnerabilities and Security of IoT Hardware. You're driving through downtown, heading to a new hot spot as your Internet-connected GPS gives you the best directions with real-time traffic updates, when suddenly your car veers out of control and accelerates onto the sidewalk. Were you just hacked? 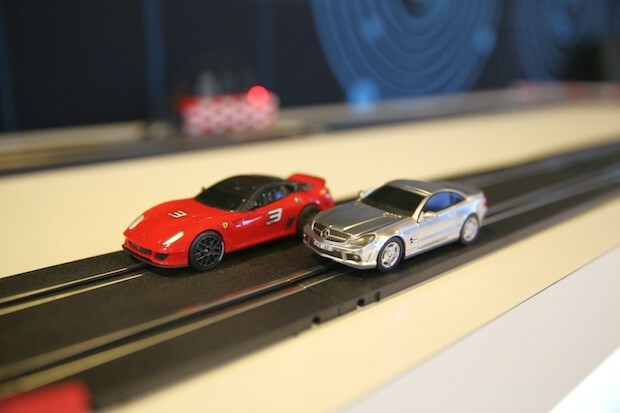 As part of a demonstration, Intel research scientists oversimplify the risks of a world of Internet of Things (IoT)-connected devices as they remotely hack into the speed controls of a targeted slot car and force it to shoot off the track. Sixty-nine percent of consumers plan to buy an in-home IoT device by 2019, according to the 2014 State of the Internet of Things study conducted by Acquity Group. By the end of 2015, an estimated 13 percent of consumers will own an IoT device. As the world races towards the next embedded, IoT or wearable system, the checkered flag can potentially mean that shortcuts are taken and hardware security is overlooked according to some Intel Labs research scientists. When systems on chips are micro-sized, they often have only functions that are dedicated to their core instruction sets, and not secondary functions like security. In the ongoing quest for miniaturization, larger components, previously dedicated to hardware security, are dramatically reduced or even eliminated. "These resource-constrained platforms are 'naked' now," says Meiyuan Zhao, senior research scientist for security and privacy research in Intel Labs. Zhao believes that as embedded systems become more common and critical in items such as medical devices and automotive systems, security architectures need to evolve to provide run-time security functionality at the hardware level. To tackle this problem, researchers at Intel are creating TrustLite, a general-purpose security feature for the so-called "naked" resource-constrained environments where tiny, self-contained computing systems often have limited space to hand non-critical functions. TrustLite provides techniques and protocols at a hardware level that protect the control units within various modern system architectures, like the ECU (engine/electric control unit) in cars, in order to prevent malicious execution of commands. "The devices we are targeting with our technology typically have zero security features," says Patrick Koeberl, security architect in the emerging security lab within Intel Labs. "At these design points, security typically drops off the table because of cost concerns: 'We can't afford the extra transistors - or energy - we don't have the power budget.'" Without protection, an ECU that governs speed, timing, valves, air/fuel mixtures and other controls of a vehicle can potentially be remotely breached by sending invalid sensor data. TrustLite, an Intel labs project, engages a failsafe protocol when unauthorized access is detected. Zhao demonstrated how a vehicle's control systems, specifically its telematics, could be remotely breached to inject commands to the system (e.g., increase the speed of a vehicle remotely). Using TrustLite to create a trusted execution environment, the malicious commands are thwarted. Instead of speeding up, the vehicle shuts down - the preferred response to a hack. "TrustLite uses the concept of a lightweight trusted module (LTM). This is a software component that we can protect with strong, hardware-underpinned security guarantees," explains Koeberl. "In the case of the demo, the LTM implements the throttle control functionality. The LTM concept is a general feature that could be anything: an attestation service, a third-party payment app, a sensor calibration routine, etc." The labs scientists have designed TrustLite and execution-aware memory protection as a low-cost and energy-efficient way to enhance security of low-end platforms, systems, sensors and even resource-constrained IoT endnodes. Moving from a simple slot car example to a vehicle hurtling down the road poses much more complexity. A toy is one thing to play with, security of real-world systems like vehicle control is another. In August, the National Highway Traffic Safety Administration (NHTSA) released a report studying vehicle-to-vehicle (V2V) communications titled "Vehicle-to-Vehicle Communications: Readiness of V2V Technology for Application." Among its detailed analysis, the NHTSA discusses the importance of security of V2V - vehicles transmitting information from one to another - safety applications and their communications. "The basis of a relevant V2V security system is 'trust' -- a requirement that thousands of data messages will be authenticated, in real time, as coming from a trusted (if unknown) source," states the NHTSA report. Wearable tech, embedded devices, on-board systems and IoT-enablement depend on security being present and robust. "If the vision of end-to-end security for IoT is to become a reality, we need to address the devices at the lower end of the compute continuum," says Koeberl. "Only then can we ensure security from the cloud all the way down."